Roll almond paste into marble-sized balls. In a bowl, combine rice crisps with cinnamon, vanilla powder and chile powder. Using a double boiler (or a sauce pan, placed over a pot of boiling water), melt chocolate chips, stirring in coconut oil, almond extract and salt. Roll almond paste balls in crisp rice mix. Dip each ball into melted chocolate, then back into rice crisps to coat again. 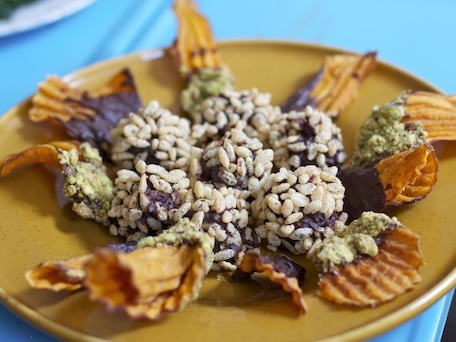 Dip sweet potato chips into chocolate, and coat with crushed pistachios. Chill on plate, in refrigerator, before serving.